Master Books commissioned this important literary work to be updated from the 17th-century original Latin manuscript to modern English and made available to the general public for the first time. In its pages can be found the fascinating history of the ancient world from the Genesis creation through the destruction of the Jerusalem temple.  Why was Julius Caesar kidnapped in 75 B.C.?  Why did Alexander the Great burn his ships in 326 B.C.?  What really happened when the sun "went backward" as a sign to Hezekiah? He was very knowledgeable to true history, and not the evolutionary fairy tales that exists today. I eagerly awaited the arrival of this book, and was amazed beyond my best expectations. The first day I picked it up, I could hardly put it down, reading long past midnight. The descriptions of the people, the rulers, the battles, the times, are fascinating. Not only is there a treasure trove of biblical information, but also many first person accounts of encounters with Cleopatra, Alexander the Great, etc. The source materials used are from the people who were there! Any one with an interest in history and notable people of the past will be fascinated. Remember Herod, who ordered the slaughter of the infants when Jesus was born? According to this, he included his own children! Read about Ptolemy Philopator, who in 216 BC tried to murder all the Jews in Alexandria by locking them in the hippodrome with 500 drunken elephants. (It didn't work.) Really, you have to see this to believe it. This is definitely worth every penny. Go To School, You Delinquent! Instead of going to school, I read this instead. I win! Summary: For more than three hundred years, Ussher's colossal Annals of the World remained inaccessible to all but the most esoteric of scholars. This is the first-ever English translation of this enormously important work. A hero of biblical chronology and one of the most astute church historians ever, Ussher is both loved and hated. He is loved by all those who share a commitment to the fidelity of Genesis as an accurate account of human origins, and who consistently hold to the literal, grammatical, historical approach to Bible interpretation. He is hated by evolutionists and compromising theologians who would seek to integrate evolutionary cosmology with the philosophy of science advocated in Holy Scripture. Many thanks to the people at Masters Books for years of research and hard work to bring this volume back to life, and in such a beautiful form. As of this writing, Amazon does not have a photo of this great-looking edition, but it is truly heirloom quality. What Augustine was for orthodoxy and Calvin was for theology, James Ussher was for Biblical historiography. No man in church history left a more indelible imprint on the thinking of Christians concerning the chronology of the ancient world than Ussher. Though he was an Anglican Archbishop of Ireland who died during the rule of Cromwell, Ussher was decidedly a Puritan. He was so revered by all, including Cromwell (an independent), that Ussher was given the honor of being buried in Westminster Abbey. For three hundred years, his rigorous and comprehensive scholarship on chronology and biblical history was considered the unassailable standard by theologians. Until the very recent takeover of our major seminaries by misguided theories of origins which integrate evolutionary cosmology with Scripture at the expense of sound theology and sound science, Ussher's work was not only a staple of Christian education, but his comments were found in the margin notes of many King James Bibles. Ussher did what no other theologian of note had ever accomplished. He dedicated an entire lifetime of study to the issue of world history and chronology. His studies required him to travel extensively throughout Europe, examining the oldest and most rare manuscripts in the world, manuscripts which today are missing or have been destroyed, which is why Ussher's work can never be replicated. Dr. Francis Nigel Lee (who has more than ten doctorates), a biographer and commentator on Ussher, explains that the Dublin-born prelate was "raised in a Bible-believing Calvinistic environment. He soaked himself in the Holy Scriptures without ceasing. He also read the Early Church Fathers - systematically, every day, for eighteen years. After becoming Professor of Divinity at Dublin's Trinity College in 1607, he wrote the Irish Articles during the next decade. Head of Ireland's foremost Theological Faculty, Ussher was internationally the greatest Anglican antiquarian and theologian of his age - if not of all time." "Ussher was very emphatic that Christianity had first reached the British Isles not via Rome but directly from Palestine. He put the arrival date, shortly after Calvary, at around A.D. 35f and not at all at around A.D. 596f (and from the Vatican). (See Ussher's 1631 Discourse of the Religion Anciently Professed by the Irish and British and his 1639 Antiquities of the British Churches. Especially the latter is highly impressive. The Schaff Herzog Encyclopaedia rightly describes it as a work of twenty years' labour, great research, and critical penetration.) Ussher was a pioneer in the historiography of the Early Church. He set out to prove that the Ancient Church in the British Isles was independent of the Roman Church and its later unscriptural traditions. Ussher's various views themselves derived from the remnants of Irish Culdeeism or Proto Protestantism readily found themselves into the later Westminster Standards based upon his own Irish Articles." Hundreds of years after first publishing this work for the scholars of his day, Master Books has accomplished the massive and expensive task of translating the entire 960-page tome so that this rare treasure trove of ancient history can, for the first time, be accessible to the general public. Updated from a seventeenth-century Latin manuscript into modern English, "The Annals of the World" contains the fascinating history of the ancients, from the Genesis creation through the destruction of the Jerusalem Temple in A.D. 70. At last, students have a comprehensive history of the ancient world which allows them to draw heavily from Scripture and primary source documents. Despite the open mockery of him by evolutionists committed to their own religiously driven view of earth history, Ussher's scholarship remains unassailable and has stood the test of time. 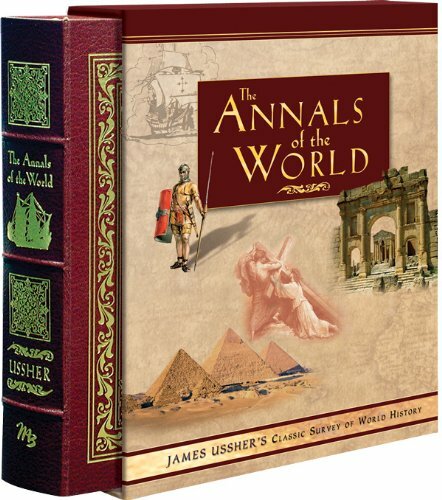 Annals of the World is packaged in a beautiful display box, and the volume itself is smythe-sewn with gold-gilded edges and foil embossing. It includes eight appendices, and contains over ten thousand footnotes from the original text which have been updated to references from works in the Loeb Classical Library by Harvard Press. 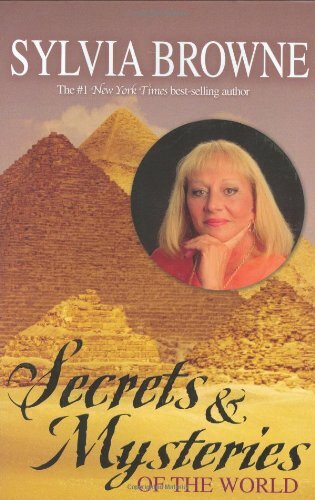 For those of us who have always been fascinated by the unexplainedor inadequately explainedsecrets and mysteries of this world, Sylvia Browne now brings her great insight. From the Great Pyramid to Stonehenge, Sylvia reveals amazing facts about some of the worlds most mysterious sites. The truth behind sacred and controversial objects such as the Shroud of Turin and the Holy Grail are brought to light; and fascinating and mystifying topics such as crop circles, the Lost Continent of Atlantis, UFOs, Easter Island, and much more are examined and clarified. I bought this book a few of years ago. I finished reading only the first three volumes. It was only this past month that I have been able to read the 4th to 6th volume ..hoping to have an understanding and perspective to the events of Sept ll...New York. This is a book that may help humanity to attain world peace and harmony. 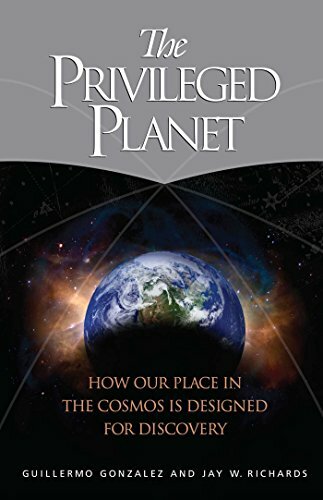 The teachings of the Masters are valid and will make a difference in the most auspicious times...of humanity as we face the next few years....this book represents the panacea for world peace and I hope more people will find their way to this book. I especially value Baird T. Spauldings, question and answers pages...I hope there will be more of his books...published..
Never in history of humanity that this book is appropriate and applicable in our circumstances of world today...the critical change is about to happen...and we all can make a difference when we learn to live according to the teachings of the Masters. I am amazed that this Baird Spalding was born May 26, 1857. 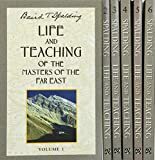 His writings and true to life experiences are timeless and if there is any thing that each one of us needs at this time ..is to experience his biography and teachings of the Masters of the Far East. As a Christian, and a bible student since i was 9 years old. I am bewildered why this book is not as popular. I recommend this to all sincere Christians...to read this book with an open heart and mind. It is the first book that I have read which finally answered an a question of what happened to Jesus after the ressurection and his meeting with his apostles...no history? As a child, I have always wondered why so little was written in the bible about his life after his ressurection ...and why so many churches protray the image of "Jesus as death on the cross." It has taken 62 years of my life...to finally read a book by a man who was born in 1857...and this is the year 2001..!!! B. Spalding's experiences "TESTIFIES" THE TEACHINGS IN "THE BIBLE"....and validates the "resurrection" of Jesus , the Christ, THAT HE LIVES! When a friend of mine gave me this series of books as a gift, he made me promise that I would read them. He knew that I do not have much time to read. He also knew that these are rather "deep", and therefore could not be properly read in ten minute segments fit into a busy day. I waited until a recent vacation, and I took the set of books along. Once I started, I could not stop. It took me over a year to fulfill my promise, and I blame myself for losing this year of my life. These books are absolutely incredible. No matter what faith you have, or do not have, you will be inspired. Although the content is amazing and sometimes incredible, it is presented with such honesty and straightforwardness that it is believable. I found that I WANTED to believe it. And I NEEDED it to be true. All limitations have now been removed from my life, and I cannot fail in my renewed mission to serve others. Thank you, Baird T. Spalding. And of course, thank you, My God. Yes, it does seem that the practice of internal alchemy faired far better in the East than in the West. After all there are many more true masters living in India and China. One may add that the general world-view there (at least in China) is more supportive of the practices and life-style required for spiritual attainments. - Spiritual Immortals are capable of supernatural powers and transformations; coming and going at will; they can shed the physical shell to attain an ethereal independence. They can dissolve into energy or solidify into form. - Celestial Immortals go even further in their work. They go beyond our human world to another world that cannot be imagined by human intellect. 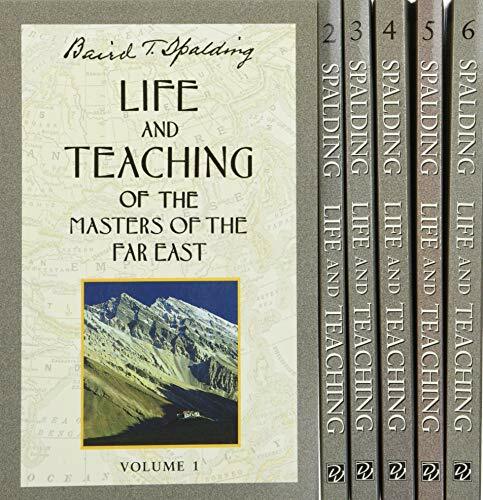 Life and Teachings of the Masters of the Far East describes lives and provides teachings from what would in Taoist Alchemy be called Spiritual and Celestial Immortals. Supernatural powers emerge spontaneously at certain stages of spiritual development, as a result of one's merging with the "All", with the Infinite, with God, with Tao. Any person who has even meditated for any extended period of time would of necessity become aware of the spontaneous emergence of certain "powers". It is only natural that as one meditates upon the Infinite Life, as one holds in his awareness the Infinite Life, that one becomes filled with more Life. It is only natural that as one hold in his awareness that which is Infinite and Eternal, free of all limitations that the limitations would begin to fall off out of his own life. It is only natural that as ones consciousness is filled with spiritual thoughts, spiritual energy begins to saturate his mind, emotions and body, spiritualizing the body in the process, re-arranging one's neurology and enabling the individual to do easily what he wasn't able to do before. There is nothing unspiritual about using one's legs to walk, why would it be unspiritual using one's higher ability to teleport. When ordinary people work at jobs using their intellectual abilities, it is no more or less spiritual then doing physical labor. So why would manifesting supply directly of the universal substance be unspiritual? Energy follows thought. All that these masters are doing is using their thoughts in a constructive way. After all, the life on spiritual path becomes easier and lighter, as one progresses along. People in Life and Teachings do not use their powers to boost their egos, but when the use of these abilities is necessary. They use their powers responsibly. Ordinary people go to schools and universities to learn some skills and get degrees. That in itself doesn't make them either spiritual or non-spiritual. How they use their skills - to help people or to take advantage of them, their motivations for using them is what would make it spiritual or non-spiritual. We all have the same amount of time and energy available and we choose how we're going to use them, whether we'll just waste our lives, whether we'll develop skills to just get by or whether we'll develop skills and abilities that will enable us to live meaningful lives. Spirituality is not something we do in our spare moments - it is the cultivation of spiritual awareness in all that we think and say and do. And yes, bodies are necessary - that's why we're here and that's why we have them. Our bodies are our alchemical labs, the vessels in which the alchemical transmutation occurs. That is where we cultivate life, where we tend our spiritual embryo, until it is strong enough that the physical body is not necessary any more. As the spiritual embryo grows and matures, the spiritual powers naturally emerge - just like a kid or a man is able to do more than a baby. And there is nothing "unspiritual" about a man using the abilities that naturally emerged with his bigger and stronger body. It is not more spiritual to keep on crawling like a baby, when one can walk, so why should one live bound by limitations of those in "mortal consciousness" after he realizes that he is not a "mortal" and "limited" being, after he is realizes that he is still as God created him, in His image and likeness - free of all limitations. I fail to understand whay so many people have given this book 5 stars. These books are filled with stories of the supernatural...telephathy, teleportation, immortality, etc... While such stories may be entertaining, enlightenment is not the result! To discover the purpose and meaning in life is an aspiration that all people desire and seek. Many live a lifetime never finding their true purpose for why they were born and what their contribution towards community should be. Parker Palmer addresses this need head on. 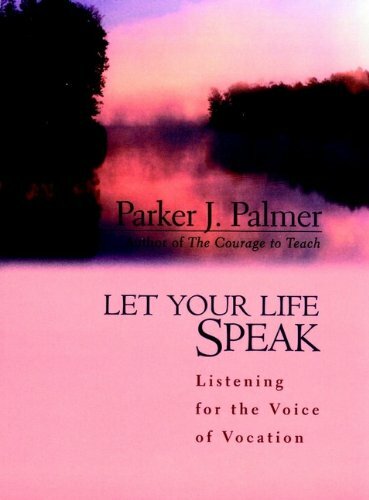 In his book Let Your Life Speak, Palmer explains that it is through listening and responding to the signs of life that we can find hope, comfort and peace. Parker uses his personal life, to tactfully illustrate the seasons of life that all experience. Parker causes the reader to explore their souls and lives to discover why we too are given our gift of life and what are we to do with it. Parker encourages this inner examination and encourages a response of reality and integrity. This little book is both practical and inspirational. Parker Palmer creates a peacful arena for understanding our own lives by sharing what he has experienced and learned from his own. I found this book to be a "quick read" on the one hand and yet I keep going back and rereading parts of it ... and then rereading the whole section. I came away from reading this book - the first time - with a peace about my life and how I have lived it. I better understand the lessons I have been taught and more faith about the path I am following. A whole lot for a little book to accomplish. "i love the fact that the word humus, the dacayed vegatable matter that feeds the roots of plants, comes from the same root that gives rise to the word humility. it is a blessed etymology. it helps me understand that the humiliating events of life, the events that leave 'mud on my face' or that 'makes my name mud' may create the fertile soil in which something new can grow." well, good for you, pal. the oft-used metaphores and life stories that are not incoherent are utterly laughable in a droll, sugary way that does not lend itself to serious reading. some people may be capable of enjoying such writing and finding it truly inspiring. i am not one of those folks, and do not reccomend this book. to anyone. 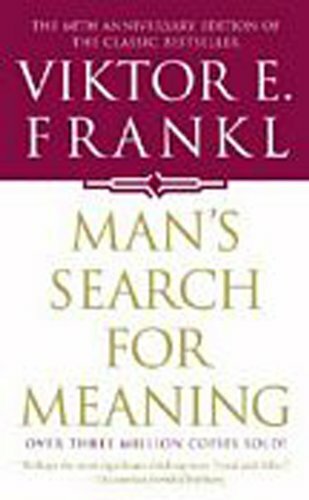 I found this book to be an interesting read into one man's journey toward self-discovery. He has some good insights into how one might take a different view of the world and find one's true vocation. From my perspective, it was a bit too self-absorbed and self-engrandizing. I would recommend this book to anyone that is depressed about his or her life and needs to find a potential source of comfort. If you have a fairly good sense of self, this book may not be of great benefit. 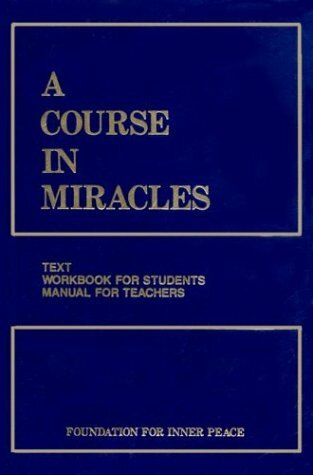 I first heard of A Course in Miracles when I was about 18. My mother tongue being French and the book existing only in English didn't help to draw me to this dense-looking book. But I could get an idea of it by reading Marianne Williamson's "A Return to Love" book in French. I recommend this book as an introduction to ACIM, as I think it really gives you an idea of what ACIM is about. A Course in Miracles is a self-study course in spiritual psychology, and like Marianne indicates: it never insults your intelligence. To ACIM, truth is love and fear is but an illusion. Some writings inspire fear, guilt and sadness. ACIM is not meant to inspire fear and if I ever ended-up feeling the slightest fear, then I knew there was something I didn't understand correctly. That was a good indicator. But ACIM brought much peace into my life. This book is not for everyone; it is "A" Course, not "The" Course. It seems like a good path for someone who enjoys somewhat obscure abstract ideas and then applying them through a semi-mystical/meditative, yet Christian-framed approach. (If you are somewhat anti-Christian, don't be put off: I was at first but eventually was able to appreciate this book's completely different approach from traditional Christian religions at least as they are practiced in my limited corner of the world. However, a warning: the book uses male terminology exclusively--e.g., we are "the Son" of God rather than even "the Child" of God, but I got past this by recognizing it is a language issue not a spiritual one.) It is both theoretical and practical, a book I mine for insights nearly every day if not as constantly as I would like. When I do apply the ideas consistently I experience joy and well-being and discover new viewpoints about my life issues that help me re-frame things in ways that help me discover my own happiness and inner peace. For example, the Course has taught me to recognize more often when I project my own mistakes (not sins or even flaws) on others and to notice that when other people are behaving obnoxiously they are usually terrified of something which helps me take a more compassionate as opposed to defensive stance. It also reminds me how temporary everything is here so I don't get too caught up in anxieties and materialism. God is but love and therefore so am I. ". . . the Course can and should stand on its own. It is not intended to become the basis for another cult [e.g., religion]. Its only purpose is to provide a way in which people will be able to find their own Internal Teacher." The miracle for me was to understand that the concepts in this book did not originate with Jesus. No one man (or former man) is the source of love. However...first and foremost...the course emphasizes that love is the answer to every question. Now, people, go out and study the Torah. This book is so new-age and completely twists biblical facts around to cater to what we WANT to hear. Like the Power of Now, this is yet another feel-good book which uses seemingly logical arguments to fool gullible people. Even if one were to accept it as truth, ask yourself: Are you believing this because it's what you WANT to hear? How can you trust or even know, of this source of 'wisdom'? The contents are highly abstract, a bit like Buddishm, whereby there is denial of this and that. Or that the elimination of desire will eliminate suffering. Yet, isn't the desire to remove desire already desire in itself?! We didn't *all* reject Jesus! David Klinghoffer believes the time has come for an unapologetic explanation of "Why the Jews Rejected Jesus." Of course, as Klinghoffer admits, it would be more accurate to explain, "Why the Jews who rejected Jesus did so." Such rejection was by no means unanimous. Despite this admission, however, Klinghoffer argues that the Jews had to reject Yeshua because of loyalty to Torah. Ironically, this argument makes the contemporary rise of a Jewish movement loyal both to Torah and Yeshua all the more significant. Klinghoffer builds his case by attacking Yeshua himself as a defective teacher of Torah who failed to fulfill the messianic prophecies of the Hebrew Scriptures. And Paul fares even worse, emerging in the book as a bogus Pharisee who probably wasn't even Jewish! To back such statements, Klinghoffer quotes modern scholarship when convenient, but dismisses it as needed. He recognizes that "today's dominant academic opinion" (p. 115), sees Yeshua and Paul as loyal Jews. But Klinghoffer argues that they actually sought to introduce an entirely new, anti-Torah, religion. Klinghoffer's disregard for scholarly details results in other errors. He consistently cites Talmudic material, recorded in the fifth or sixth century, to define the Judaism of Yeshua's day. He places the decisive break between Judaism and Christianity in the first century. Modern scholarship, in contrast, views the break as gradual, not becoming final until the fourth or fifth century. Klinghoffer's handling of biblical prophecy is shaky on numerous points as well. Despite such flaws, the book has some value for its impassioned presentation of Jewish objections to faith in Yeshua. The Messianic Jewish community, as well as the Christian community, needs to understand and interact with such arguments. Oddly, the book's main thesis echoes Romans 11. Klinghoffer sees Jewish rejection of Jesus as "The turning-point in Western History." Without it, the Jesus movement would have remained a small Jewish sect, and Christianity, with all of its historic benefits, would never have developed. In Romans 11, Jewish rejection of Yeshua results in salvation for the nations. But for Paul, Jewish acceptance of Yeshua is consistent not only with Jewish identity, but with the very words of Torah and the prophets. Jewish rejection of Yeshua had its purpose, but Jewish acceptance will be "life from the dead." --This review appears in the June/July issue of the Messianic Times. This book is a good survey of Jewish literature on Christianity through the centuries and makes a number of thought-provoking points.It is definitely worth reading for the familiarity it gives you with a variety of Jewish viewpoints as well as the variety of possible objections to Christianity.I particularly appreciated Klinghoffer's frankness and the challenge he gives to Christians to read the New Testament through Old Testament eyes. However, I do have some reservations about the book.First, Klinghoffer seems to suggest that if Jews had accepted Jesus, it would have fundamentally affected Christianity, but not Judaism.Why not?He also seems to think Islam would have arisen as it did in spite of Christianity petering out after the fall of Jerusalem.This in spite of the fact that the Koran makes a number of references to Jesus and his rejection by the Jews and generally sides with Jesus against them. It seems that both Judaism and Christianity are essential to the foundations of Islam. Like Hyam Maccoby, Klinghoffer seems real attached to the idea of "normative Judaism. "Because Paul did not take a position like the Talmudic Judaism that developed later, both suggest that he wasn't really a Jew.But as I pointed out in my review of Maccoby's Mythmaker, there's quite a bit of evidence that the anti-Torah Gnostic movement started out as a movement among Jews.There have been "dissident" Jews throughout their history, and trying to impose a "normative" viewpoint that really developed later on people like Paul and Jesus is questionable. A related point is that both Maccoby and Klinghoffer cite Acts 22:3 for the claim that Paul was a disciple of Gamaliel.While I agree that this seems doubtful, it's important to recognize that Paul never made such a claim in any of his own books, so this need not reflect negatively on his honesty.Maybe Gamaliel really would have given him an "F" for his theological reasoning, but that doesn't prove he couldn't have identified with Pharisaism before his conversion.And the composition of such speeches as Acts 22:1-21, telling us what figures "should have said" or "might have said," is a known device of ancient literature. Klinghoffer's master point is that Jews could not accept Jesus because of their adherence to the Torah.I don't find that fully convincing.Though he raises some good questions about the Christian interpretation of Jeremiah 31:33, there are some questions one could raise about Israel's continuing adherence to the Torah.What about the apparent abrogation of Deut. 23:1 in Isaiah 56:4-5?What about the difference between the fates of Hezekiah (see especially II Kings 18:5-7) and Josiah (II Kings chap. 22-23), which raises some questions about the Deuteronomic understanding of righteousness and reward?It seems highly likely that the Book of Job is an attempt to deal with this theological failure by making a place for truly undeserved suffering. To close, I'd like to offer my own alternative to Klinghoffer's bold and fascinating theory of the foundations of Western civilization.I propose that Paul's teaching was one of the preconditions for Western, pluralistic society.Both Judaism and its younger daughter Islam are religions of law, attempting to govern not just our inner piety but our behavior in society.I think Paul's teaching that "the letter kills, but the spirit gives life" (II Cor. 3:6) may have been an important ingredient in the development of a pluralistic society, because it put limits on anyone's ability to regulate others.If spirituality could not be codified in a set of laws, then the way was open for many varieties of it.After the Roman Church attempted to create a "Christian law" in the Middle Ages, it was at least in part this teaching that enabled Luther to resist it.And once Christianity could not be controlled from Rome, varieties that even Luther could not have foreseen or embraced, such as churches with women pastors, became possible. Could it be that Reform Judaism would have been impossible without Paul?After all, it started in Germany, the homeland of Lutheranism.And what if even Orthodox Jews live more freely today than they would have without it?I hope a "Reform Islam" will arise, too.I'm not interested in "converting" Jews and Muslims to Christianity in the normal sense, but perhaps they should recognize Paul as part of their religious/cultural heritage. David Klinghoffer is a political conservative who has much in common with Evangalist Christians on a political and social level. In this book, he explains why Jews cannot share their belief in Jesus, however. Belief in Jesus encompasses two concepts, that Jesus is the Messiah and that he is a deity. In looking at purported messianic prohesies of Jesus in the Jewish Bible (in books such as Isaiah, Jeremiah, Ezekial, and other prophets), there are two different viewpoints. Christians, who have already accepted Jesus as the Messiah see passages, such as Isaiah 53 as pointing to Jesus. Messianic prophesies are cryptic and somewhat obscure but, if you have accepted Jesus, these verses seem to make sense. On the other hand, if you have not accepted Jesus as the Messiah, these verses do not lead to the conclusion that Jesus is the Messiah and any such Messianic proof seems like circular reasoning. In other words, since X happened to Jesus, prophesy Y must apply to him. But, if you were to say, prove that X happened to Jesus, the proofs don't add up. Stated differently, Klinghoffer says that there is a certain "heads I win, tails you lose" quality to many Christian proofs. For example in Jeremiah, there is the specific reference to a "new covenant." The argument is that this new covenant is the abrogation of Torah which is replaced by Jesus. But, when the next sentence makes it clear that this new covenant means that Torah will be etched in our hearts and not replaced, the words are considered symbolic. So if there is a specific reference to a new covenant, it is "heads I win." But, if there is a specific reference to something that would disprove the alleged prophesy, another, symbolic interpreation is given to that verse and it becomes "tails you lose." Besides being the Messiah, under Christianity, Jesus is the son of God and, indeed a deity himself as part of the Trinity. Jews also don't accept this. To Jews, this goes beyond monotheism. Klinghoffer looks at the prophesies from the standpoint of Jews living before Jesus was revealed. To those Jews, studying such prophesies would lead to no conclusion of someone like Jesus. Anyone ignorant of Jesus would see nothing pointing to him. A little later, Jews living at the time of Jesus saw no Messianic prophesies come true, thus, they did not accept Jesus. When Jesus was not accepted by the Jews of that time, Paul and James met and decided that Torah practice was no longer necessary, thereby opening the nascent Christianity to the Romans and other pagan nations. By breaking away from Judaism, this assured that Jews would not, on any large scale, become Christians. Klinghoffer states that this Jewish refusal to accept Jesus was actually a benefit to Christianity. If Jews had accepted Jesus, the commandments of the Torah would not have been abrogated. Therefore, Klinghoffer posits that there would have been no large scale conversion by the pagans because the requirements of circumcision, keeping kosher, strictly observing the Sabbath, etc., would have had an appeal only to the Jews. However, when the Jews did not accept Jesus and these commandments were abrogated so as to appeal to the pagans, Christianity grew to become the major force in Western Civilization. So, Klinghoffer concludes that if Jews had accepted Jesus, the course of Western Civilization would have been markedly different. I'm not sure history would have unfolded the way Klinghoffer envisions but, this is avery interesting thesis. Anyway, I hope that this book will be read by Christians, not as a disputation, but rather as an attemppt to understand Jewish thinking leading, to mutual acceptance. 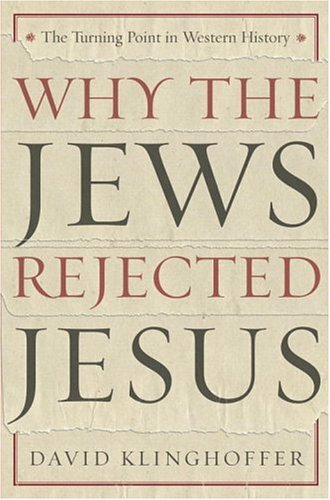 David Klinghoffer wrote his recent book "Why the Jews Rejected Jesus" (2005) in response to Mel Gibson's movie "The Passion of the Christ".The major purpose of the book is stated in the title:to explain why the Jews, or most of them, continued with their Jewish religion and practices and refused to accept Jesus as the Messiah.Klinghoffer is a practicing Jew who was raised in a non-observant home and came to take Judaism seriously during his college years.He is also a political conservative which, for me, is refreshing.He has written, on the whole, a solid interesting study showing extensive reading and thought.There is much to be learned from this book.Unfortunately, portions of the book are unduly polemical.Klinghoffer goes out of the way, frequently, to be provocative.In addition, the tenor and theme of the book tend to shift as the study goes along.This is not necessarily a bad thing, but the reader needs to be aware of it and to see it happening.Klinghoffer greatly overstates the originality of his work, but this is common enough among writers. There is something to surprise every reader in this book.Klinghoffer begins by noting that Jewish traditional texts include materials about Jesus that is frequently suppressed.Some of these materials suggest that some leaders of the Jewish community did indeed play a role in the death of Jesus.I had not realized this before, and Klinghoffer is to be comended for his candor in making this information available to a wider readership. The question remains of the reasons which compelled the Jews to stay with their own faith.Here Klinghoffer gives a variety of answers which could have been organized more coherently.Jews believed, Klinghoffer argues, that they had a relationship with God revealed at Sinai and set out in the written Torah and in the Oral Torah -- later codified as the Talmud.Jesus and his followers denied the Torah in key respects that could not be accepted by Jews.Also, Klinghoffer claims, the arrival of the Messiah was to be accompanied by a change in the world, inhuman attitude and conduct and in the end of opression. But Jesus did not remove the yoke of Rome, and the world went on as it had before. The book includes a great deal of discussion of proof-texts -- verses from the Old Testament that many Christians have claimed prophesy the coming of Jesus.Klingoffer offers a laborious view of these texts and of Jewish responses to them.He shifts during the course of his study from the claim that the texts couldn't possibly mean what Christians say they mean to a claim that the texts are difficult, obsure and oracular and that reasonable people can differ about what they mean.For me, the use of proof-texts is based either on a literalist or traditionalist view of revelation and of Scriptural interpretation that have little appeal for me.But others may differ. As the book progresses, it takes a more ecumenical, inclusive approach.Klinghoffer discusses medieval and early modern Jewish philosophy which attempted to create a bridge of sorts between the two faiths.Both Jews and Christians worship the same God and both have a place, for believers, in God's scheme of things.Jews are the people of the Covenant while Christians approach God through Jesus.This was essentially the approach of the great Twentienth Century Jewish thinker, Franz Rosenzweig (1886-1929).Klinghoffer discusses Rosenzweig briefly (pp 200-201), but it would have been well to hear more.Klinghoffer finds that both Judaism and Christianity are of almost equal stature and nobility, and both faiths constitute ways in which a religious person can learn to worship and serve God.This is a valuable and serious teaching, but it represents a shift from the polemics and the scriptural hair-splitting with which the book opens. Klingoffer states at several points that the Jewish rejection of Jesus was the key event in Western history because, if Christianity had remained Jewish and had followed Jewish law, the faith would have been too difficult and demanding to have mass appeal.This is an important point to make, but Klinghoffer nearly spoils it by burying it under a morass of speculations and counter-factuals. 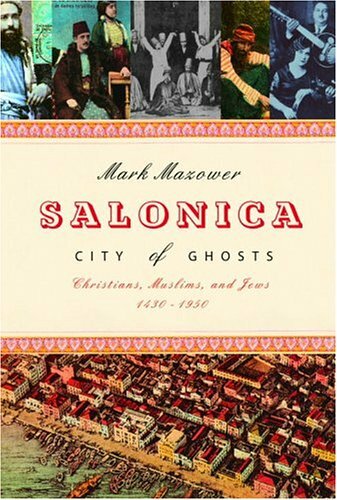 This book is well-meaning, well-informed and sincere.As I have tried to explain, it is somewhat too brash and unfocused and requires close attention to follow the where the argument appears to lead.The heart of the book is near the end rather than the beginning.For those wishing to explore Jewish-Christian relationships in a less polemical manner, the reader may wish to consult the Institute of Christian and Jewish Studies, formed by a group of Christian and Jewish scholars to explore points of commonality -- the values of prayer, study, and faith among others -- between their two traditions.This group is readily accessible on the web. Having read his previous books I was compelled to purchase this one solely on the strenght of the author. I must conlude that I was not disappointed by any means. As the title implies this edition traces the use of monatomic gold known as (Mfzt to the egyptians) by the royal bloodline extending to the ancient sumerian epoch until today. 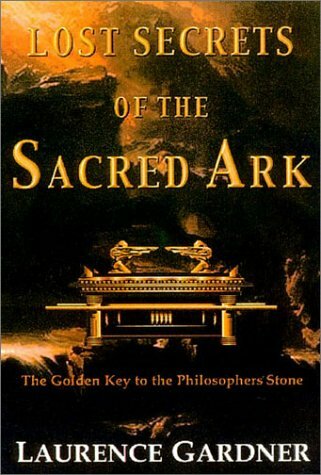 Beautifuly backed up by a description of the Hudson experiments dealing with gold transformation, the ideas in this book trace the origin of the ark and its likely use as a medium containing the tablets of destiny and its use as a possible converter for gold transformation. This book is a definite must-read for Gardner fans even though some of the information is repeated from previous works. Nevertheless the focus is definitely shifted to the above. I found this book very easy to read and hard to put down. Weather you agree with his theories or not it's obvious he's done a tremendous amount of research. If your are at all interested in ancient history mysteries you will enjoy this book. It's so well written I'm now getting his other books. There seem to be only 2 possible views of this book, one is that the author is having a joke at the expense of his readership, the second is that he is deliberately junking his own reputation and so that of all his books and their contents. References are mostly either to "Jesus the Man" or his own books, which in turn reference "Jesus the Man" or his own books. 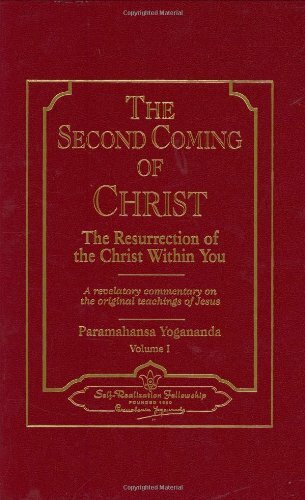 In this unprecedented masterwork of inspiration, Paramahansa Yogananda takes the reader on a profoundly enriching journey through the four Gospels. Verse by verse, he illumines the uni­versal path to oneness with God taught by Jesus to his immediate dis­ciples but obscured through cen­turies of misinter­pretation: "how to become like Christ, how to resurrect the Eternal Christ within ones self." Never before available in its entirety, this landmark work by one of the most revered spiritual teachers of our time transcends divisive sectarianism to reveal a unifying harmony underlying all true religions. A groundbreaking synthesis of East and West, it imparts the life-transforming realization that each of us can experience for ourselves the promised Second Coming -- awakening of the all-fulfilling Divine Consciousness latent within our souls. KEY BENEFIT: Living Religions is a sympathetic approach to what is living and significant in the world&rsquo;s major religious traditions and in various new movements that are arising. KEY TOPICS: This book provides a clear and straightforward account of the development, doctrines, and practices of the major faiths followed today. The emphasis throughout is on consciousness of believers and their own accounts of their religion and its relevance in contemporary life. MARKET: For professional theologians and others interested in the development of the major religions practiced today. The book is corrupted by (as written on the back of the book)"Increased coverage of the role of women in each tradition. "What a waste of space!I could have been learning more about the religions. This textbook not only looks at the history of different religions, but it also shows you the contemporary version/manifestation of each religion.As an instructor, I found this very easy for my students to understand and relate to. 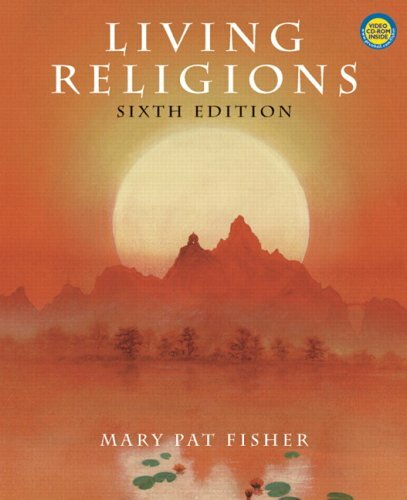 One of the strongest points of this text is the interviews with different contemporary people to explain religious belief.An example of this would be an interview with Ann-Ping Chin on Confucianism in today's society.This is much easier for students to relate to than using discussions of ancient religious leaders only. Each chapter has a list of suggested readings, which I found very useful in preparing discussions.The publisher also has a web-site with exercises and links for each chapter to assist students in studying the different religions. Many years ago I read the "original" version and thoroughly enjoyed it. This Modern English version is even better because it's easier to read and comprehend, although I have to admit I missed the "Slough of Despond" (now the Swamp of Despondency). 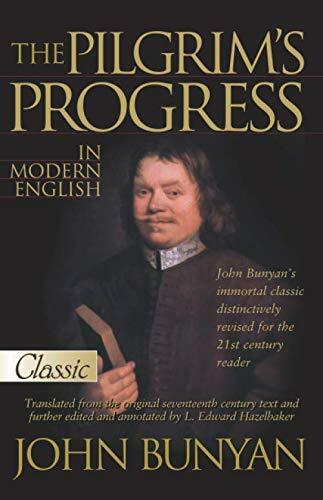 Bunyan has depicted the major pitfalls in the life of the "born again" Christian in an understandable and believable way. Especially helpful are the footnotes which allow the reader to refer to the Scripture passages Bunyan has used to support his allegory. If you are already traveling in "The Way," read this book for encouragement on your journey. If you are not already a Pilgrim, read this book to find out what you are missing and how to enter at the narrow gate. Inspring Way to learn the Truth. I first read this book back in the seventies. Since I have also used as a Bible study tool and great source of allegorical illustration of the Christina life. It is a wonderful story for Christians of all ages to study and enjoy. Surly God blessed John Bunyan with a special insight into Discipleship. I recommend strongly sticking with the Modern English version of the book because of the vast differences in past speech patterns. The book is well worth your time and effort. Any serious student of Scripture will certainly find it's contents valuable and very insightful. What a treat! It's hard to beat the classics and Pilgrim's Progress is one of the greatest Christian classics ever written. I am glad it is now in modern English. I read a few pages every night with my family. It makes a great devotional book and sure beats all gathering around the television. My children are age 17 and 12. One might think they are too old for such a thing, but not so. If you have young children at home, skip the little devotional books for a few weeks, shell out a few dollars, buy the book, and start a new tradition of introducing your family to the classics. Go from this to The Lion, The Witch, and The Wardrobe and you may break the TV habit for good!. . . Perhaps . . . I'm a Chinese girl. I got a traslation job to help with the publishing in China.I found it really interesting and helpful with my belief as I read it. I love this book.Hope we'll have more books like this in China, and in Chinese. I have owned the Pilgrim's Progress for years but have never read it. I started and then thought the book was boring and hard to read so I promptly quit. The original language is somewhat hard to understand so purchasing a book with notes and added definitions is helpful. However, since beginning to really read it, I have found I was completely wrong. This is one of the most influential and captivating books I have ever read. The powerful allusions to the Bible are abundant and threaded in carefully. It paints a vivid picture of the Christian life and the struggles, temptations, and tests that come with that path. Although it was mostly written for Christians, I am sure that this book can be enjoyable to almost anyone. To Christians, however, it is an encouragement. It helps you remember that there is a reason to press on and that you're not in it alone. Better than prayer of Jabez book!!! Many people have jumped on the "prayer of Jabez" wagon, but much of the theology is not accurate to the whole counsel of God's Word. Randy Alcorn has once again showed us a true biblical principle of how to have an eternal perspective on "giving" and God's blessings in our lives and what God wants to do in and through us if we walk in obedience to him. I would highly recommend this book for any and all believers to read and discover for yourself the true ..."treasure principle!" I completely agree with the reveiwer who said this book should be required reading for every Christian. I think new Christians would especially benefit from this book. 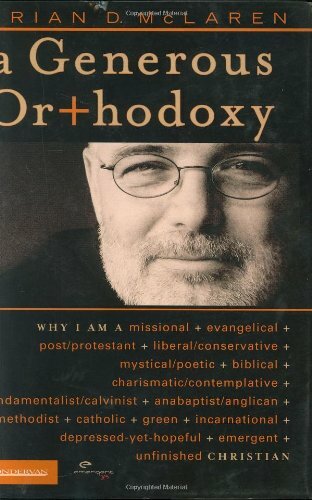 However, I have been a Christian for 10 years and I also got a lot out of this book. This book has given me a clearer understand of what exactly stewardship is and how to live it out. Before, I had only a hazy understanding of the meaning of stewardship, much less how to live it out. This book convicted me in so many different ways and caused me to re-think many of my previous attitudes towards both stewardship and giving. 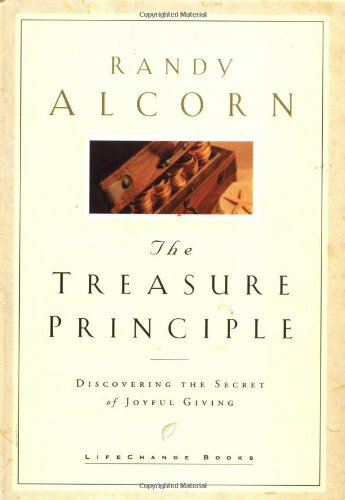 I believe that "The Treasure Principle" is one of the best, most concise books out there on the subject of stewardship and giving. This is a book that should be read and then passed on to someone else. This book is nothing but propaganda to get people to hand over more money to the church. Jesus never said that you can "invest" your worldly money in the church to receive rewards in heaven. Yes, he said you should give your money away, but the point is not to do it in order to receive riches in heaven. Funny that most of the people passing this book out are pastors. Do you think they might have something to gain from convincing people of this author's premise? Randy Alcorn's book contains a lot of wisdom about Christian living and Christian giving: I think every person who wants to live for Christ will be blessed by reading this book. However, it is a shame that he teaches tithing, when this is clearly not the focus of the New Testament. And some of what he has to say about himself, and particularly his comments on abortion, distract from what he is writing about. Do I agree with his abortion stance? Yes, but that is not the subject of this book and wuld put some people off. But, with this qualification, I heartily recommend the book, because of the 6 excellent principles for giving which he articulates. Established Christians should already understand the truths brought forth in this small (92 page) book, but unfortunately, too many either do not or do not practice the truths they know. New Christians often have never heard the principles listed. Too many churches are too quiet on the subject of money. This book will make an excellent teaching tool for confirmation classes, discipleship groups, and home Bible studies. This book does not cost much, will help Christians grow, and could help strengthen the church. The book is filled with pithy quotes like this one, "It's increasingly common for Christians to ask one another the tough questions: How is your marriage? Have you been spending time in the Word? How are you doing in terms of sexual purity? Have you been sharing your faith? but how often do we ask, 'How much are you giving to the Lord?' or 'have you been robbing God?' or 'Are you winning the battle against materialism?'" (p.81). Within the next thirty years, one-third of China's population could be Christian, making China one of the largest Christian nations in the world.These Christians could also be China's leaders, guiding the largest economy in the world. What is happening in China is what happened to the Roman Empire nearly two millennia ago-a great power transforming itself.The results could be astonishing. In Jesus in Beijing, David Aikman recounts the fascinating story of how Christianity began in China (even predating Francis Xavier and the Jesuits), the bloody anti-Christian persecutions (especially under the Communists), the revival of an underground Christian movement led by brave men and women rising death, and the flowering of Christianity today-though still under persecution. He equates "easy believism", "quick coverts", and "cheap grace" as true belief and repetance...Most of the teaching of the gospel in China is quite inept, weak, cheap, and even non-Biblical. Rarely is there a call to true discipleship. This leads to many "decisions", which on the surface look legitimate, but in fact, do not have root and therefore often wither. Aikman equates these "decisions" with true Biblical belief, and therefore exagerates the affects of current mission endeavors in China. Secondly, he thoughtlessly and wrongly associates and interconnects Christianity with Democracy and Western Ideology. With the rise of one, so the other. This joining together of the church and state is unfortunately (I say again, unfortunately) the majority of the current preaching of the gospel in China. Chinese people want a more affluent, western lifestyle...Christians (affluent westerners in their minds) come preaching a gospel not of self-denial but of "finding happiness", this looks appealing to your average Chinese person. Hence, acceptance of this "American" brand of Christianity is an acceptance of democracy as well (in some form or another). Aikman, perhaps rightly presents these actual findings, but he presents them as something positive and something to be commended. 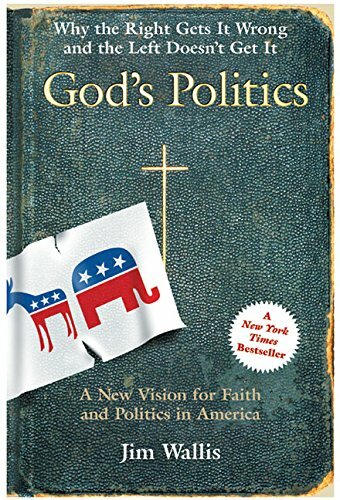 Well, David, this may be good for American politics and world democracy in general, but this is awful for the gospel and true biblical discipleship. Missions and the preaching of the gospel is not about spreading an ideology of democracy and this world's kingdoms [which is alluded to even in Aikman's subtitle "How Christianity Is Transforming China and Changing the Global Balance of Power"], but about spreading the idea of dying to self and living to Christ and coming under the authority and power of the kingdom of God (which will often times look quite different from western democracy and even the western-brand of Christianity). That's the more objective reasons as to my distaste for this book. This book has led to a more severe crackdown on missionaries in China. Post-publication of this book, China officials have radically beefed up their inquiries and investigations into missions work there; this is mainly due to this over-exaggerated and TOO PRO-DEMOCRACY book by Aikman. These investigations are escalating to such an extent, that it looks as though my close friends doing orphan work, benevolence, and leadership training in China are about to be kicked out. Aikman didn't even "change the names to protect the innocent". What was he thinking???? He mentioned them by name in the back of his acknowledgements. Well, American Christians may get teary-eyed from reading Aikman's report about "all that God is doing there in China", but I can tell you for sure, that the missionaries there in China are teary-eyed praying night and day that they won't get discovered, not so they can save their own lives, but so that they can continue to stay in that land struggling and laboring to faithfully administer the word of truth. Aikman didn't do us (and especially not those missionaries) any service here! I read with interest the stories and information about Christian brothers and sisters in China. The body of Christ in China has been through, and continues to go through, much travail and persecution. Their faith, and the miracles and healings that occur, make the Chinese Church much like the first century Church under the Romans. I have lived in China recently and fellowshiped at a Three Self Church in a large central China city. It was a church with a strong evangelical sense. Most worshippers carried their own Bibles, they prayed fervently, sang heartily, and took notes on the sermons. They welcomed foreigners. Reports of other Three Self Churches in other places were variable, however. There is apparently quite a range of vitality among the Three Selfs, and so a broad characterization of them is not fitting. 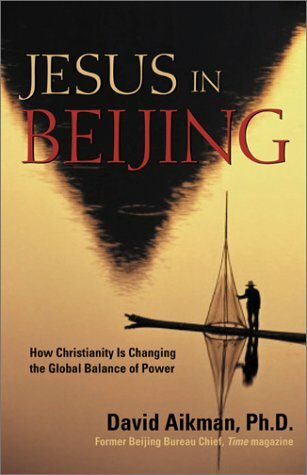 Aikman's subtitle -- How Christianity is Transforming China and Changing the Global Balance of Power -- had led me to expect a much greater analysis of transformation and balance than actually occurs in the book. These topics are treated mostly in the last chapter. Overall an enjoyable, and informative read. As the pastor of a small church for internationals - most of whom are from the People's Republic of China - I read this book with personal interest. It concerns many of my friends and their country - which at times I think of as "my" country. Let me begin by emphasizing the positive dimensions of the book. Its survey of the history of Christianity in China, its focus on individuals especially of the 20th century and mostly in the house church movement, its (inconsistent!) efforts at balance. It is worth reading, and we need to hear the stories of suffering, courage, faith, and triumph that are found therein. 3) Its hypocritical(?) stance(s) on the relationship between Christianity and politics/capitalism. 1) I have persons who have become Christians while attending TSPM churches, and persons who became Christians through house churches. American Christians should categorically call for full religious freedom in China - no one should have to register with or work through TSPM. But we also need a little more understanding of Chinese Christians who choose to worship/minister "above ground". 2) Aikman uses the word "orthodox" a great deal - and clearly by it he means conservative evangelical Protestant theology. Aikman paints with far too broad a brush "Modernism" as the opposite of authentic Christianity (see pages 147, 156-157 et passim). Not everyone who rejects "conservative evangelical Protestantism" is a modernist, or a liberal, or "not a true Christian". I think Aikman too often presents us with a false dichotomy - either you are a "fundamentalist" and orthodox, or you are a "modernist" and liberal. He needs to allow a bit more room for other faithful and committed understandings of the Christian faith. 3) Aikman loves to criticize those Chinese who try to blend Christianity and politics. Who say, "Make Christianity serve socialism/Communism". Fair enough. Meanwhile notice how much Aikman tries to sell the "benefits" of Chinese Christianity in terms of capitalism, a pro-Western China, a big ally against radical Islam. How often do American evangelicals wed pro-American patriotism to their Christian faith? (If you don't know what I mean, look for cars with stickers that have an American flag draped over the cross. We sing patriotic songs in our churches while some Chinese Christians get in trouble for refusing to do just that.) If Christianity should not be twisted into the handmaiden of Communism, perhaps neither should it become the herald of Western capitalism. Aikman's text is an excellent field ehtnography of Christianity in China, with a particular bias towards Chinese house churches and the growing evangelical movements in China. This text, however, does not give an unbiased view of Chinese Christianity (it tends at times to be somewhat disparaging of the Three Self Protestant Movement and Bishop Ding), nor does it answer the question about the global transformation of power (my guess is that this was an editorial choice of titles to makimize book sales). What Aikman DOES do, however, is provide a sweeping view of evangelical Christianity in China, giving us a birds' eye view of some of the challenges and problems of China's church today, while documenting major leaders of the autonomous house churches. I heartily reccomend this book for anyone desirous of learning more about evangelical Christianity in China today. This is a recreational read for me. I am interested in China and in Christianity. The book struck me as shallow and superficial from the beginning and despite my best intention to believe it could be more never overcame that first impression. The author is too influenced by his newspaper training, for the book reads like a series of short newspaper articles, it leaves you wondering what it is that you learned and asking for more. Now i don't know how much is available to the Western world concerning what is going on to Christians in China. As a glimpse into this world, via short biographies of the people involved it is just acceptable. He obviously travelled to places and saw people that i can only dream of and i can admire and wish to learn from that experience. But i wonder about the depth of the conversations or the critical judgement of the author if these snippets represent the meetings. They are like the small talk that takes place at a party rather than the deep sharing that ought to take place between brethren in the faith, trying to share the things closest to their hearts. Several places the author leads into big questions: the role of women in the church, pentecostal character of the church, the role of house churches, the relationship of church and state etc. where there was good opportunity to tell us what the people he met thought. But he doesn't go very far, and leads to a complaint of shallowness and superficiality beyond the style of the book. Even with endnotes he doesn't continue the conversation with references or notes to the same phenomena in the west. I definitely feel that he drops the ball and really doesn't tell us very much about these people. Trailer park Advaita for the unwashed! It has taken David Icke 15 years (since his epiphany in 1990) and umpteen books to reach the same conclusions that he could have jumped to in 15 minutes spent reading about Ramana Maharishi. Stripped of all the breathless scattershot verbiage, the message boils down to (as the title says) "Everything is an illusion". Individual human consciousness units are game pieces trapped in an artificial Matrix - a web of deception designed to milk fear and other negative emotions for use as energy for its own sustenance and expansion. Pretty much everything you could roll out as a topic for conversation is just another brick in that wall - space, time, nature, DNA, science, religion, technology, art, education, medicine, and of course the financial system and the endless wars - you name it. The shape-shifting reptilians for which David Icke was once radically famous are now pretty much demoted to minor bit-player operatives in the overall scheme (and even come in for a bit of sympathy). The book's message really is pure "Advaita" - the ancient Hindu doctrine that, well, "Everything is an illusion". 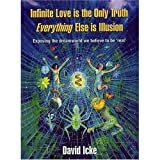 The part about Infinite Love is so removed from regular human garden variety love (which all its pressures, pains, and fears) that you might as well tag Icke's concept as Advaitic "Self" (big S!) and be done with it. A book like this (in fact most of Icke's books) also really show the influence of the Web on authorship. Anybody can be an instant expert on anything, but that fact-finding power doesn't necessarily confer logic or organization skills. So given all this kvetching, why my5 Star rating? Simple! I mean the answer to that is simple, and the reason is that Icke presents the same message more SIMPLY and more humorously than the regular Neo-Advaitic authors. The presentation of core concept "Everything is an illusion" by the current crop of Neo-Advaitic authors (no, "Neo" isn't a reference to The Matrix here, it just means the Western 21st century appropriation of classical Advaita by such as John Wheeler, Nathan Gill, Jan Kersschot, and so on) are so bloodless, dull, and humorless that Icke's version cuts through them likea top-end Harley Davidson hog through a kid's tricycle race. Admittedly though Icke gilds the lily a LOT more than those purist Neo-Advait's mentioned, with his digressions about natural health maintenance, sexuality, 9-11 conspiracy, Jewish religious law (he should've gone easier on that particular one, why continue to feed the spurious charges of anti-Semitism? ), and on and on. One area where Icke is a bit naiive is that he seems to accept some kind of unit of "consciousness" as the subject for all the deception. "Your consciousness is trapped" type of thing. What is that - "consciousness"? Is there some base unit of inviduation there that we need to deal with? I remember somebody once asked Ramana - "How should we treat others?" His answer - "There are no others." But I think Icke differs in one small way from the Neo-Advaits in that they seem to say that there is no escape apart from acceptance. 'Lie back and enjoy it' type of thing. 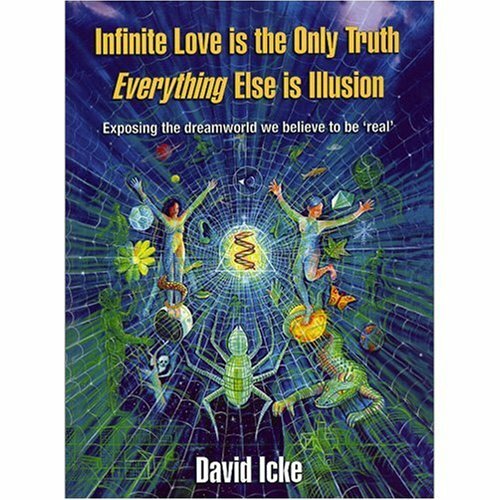 Whereas Icke seems to feel you could really jump ship entirely, into a pool of pure infinite Love. Anyway, I want to know HOW to escape! For now, this book will at least get you out of your cell and into the prison yard. As Americans continue to worship at the altar of cultural diversity and endorse religious tolerance for tolerance sake, Muslims masquerading as "moderates" have insinuated themselves into the very fabric of American society, taking advantage of our blind trust and gaining footholds in our education system, government, workplace, law enforcement, and military. In this startling book, investigative journalist Paul Sperry uses revealing new interviews and classified documents to courageously explain how, for the past thirty years, these Islamist extremists have been covertly working to destroy our constitutional government and the Judeo-Christian ethics on which our nation was built. Their goal, according to Sperry, is to replace the U.S. Constitution with the Quran and turn America into an Islamic state. And, as Sperry details point-by-point, they have been unwittingly aided in their sinister aims by the politically correct media, government, and citizens, who don't fully understand the dangers of the Muslim faith. Infiltration explodes the facade of moderation and patriotism that Muslim scholars, imams, clerics, businessmen, and other leaders in the burgeoning Muslim community in America have conveyed in the wake of the 9/11 terrorist attacks. In reality, the Muslim establishment that publicly decries the radical fringe-represented by al-Qaida's brand of Islam known as Wahhabism, the official religion of Saudi Arabia-is actually a part of it. The only difference is that they use words and money instead of bombs to accomplish their goals. Now, thanks to Sperry's peerless research, piquant prose, and forthright presentation, their cover is blown. He will not only make readers forget nearly everything they've been told about these "moderate" and "mainstream" leaders, he will expose the true agenda of these "moderate" and "mainstream" leaders, and he will explain the full scope of the dangerous threat of Islam in America. With everyone still on edge after 9/11, this book will garner wide interest, appealing specifically to people interested in current events and/or religion. Additionally, the book will appeal strongly to women whose roles, values, and rights are greatly threatened by fundamentalist Islam. This book is a must read for all Americans, and should be especially required reading for White House and Federal law enforcement leadership who continue to pander to radical Islamist leaders at the peril of America's security, short-term and long. Since my name is mentioned in an unflattering review of this book, I want to make clear that I wholeheartedly endorse this book.Paul Sperry clearly spent a great deal of time compiling original work and documentation for some of the most frightening details of how, before--and especially since 9-11---our security has not improved b/c the very people we are fighting have infiltrated government at the highest levels.I and others have written about Islamic Jihad Sami Al-Arian, Grover Norquist, Suhail Khan, and others who've had the ear of the White House and President Bush.But Paul Sperry has gone many steps further.His documentation is simply incredible, as is his reporting and original work. Questions, which Sperry raises, remain: Why Grover Norquist, despite Sperry's irrefutable documentation of Norquist's ties to terrorist groups, remains a large figure in the conservative movement, the Republican Party, and at the Bush White House;Why FBI Director Robert Mueller, President Bush, and even local special agents in charge in many major cities continue to break bread with those who openly declare their desire to destroy us for Allah. Mr. Sperry's theory is that the Koran is nothing but sickening violence and contains no good lessons for life, yet he stops short of saying we should rid the world of Muslims and their religion.Instead he says we should increase defense spending.How is his proposed sollution to terrorism any remedy for what he says is the problem? This book is nothing but a bunch of hyped up conspiracy theory about Arabic speaking government employees plotting to disrupt our country's defense while at the same time claiming that the real problem is the religion of Islam itself. Of course anyone that follows centuries old religious doctrine literally is going to cause some problems.This includes the "extremist Islamists" that interpret the Koran literally because Muslims were historically treated terribly by European Christians and the contempt shows in their religious practices.But the same can be said, to a much lesser extent, for strict constructionists of the Bible that are still waiting for Jesus to return to earth and say "hello" and also refuse to believe in a scientifically undeniable theory of evolution b/c we must all be decendents of the Adam and Eve - that white couple in the middle east that wore fig leaves and talked to god and the devil, (the type of people that are today called the mentally disturbed). The difference between Christian and Muslim exremists is that Christians have not suffered through historic prejudices from the most powerful civilizations like the Muslims b/c the Christians made up those powerful civilizations and istitutionalized descrimination.It should be expected that there would be radical Islamists, as Mr. Sperry speaks of, that hate Christian Americans.Now that we have taken a taste of their terrible medicine on 9/11 Christian Americans are getting a bit of extremist blood running through their veins. Just be careful because born-again Christian Americans might just become the world's next extremist party that needs subdued by any and all forces necessary.This hateful, retaliatory practice of eye-for-an-eye war that has been brewing amongst the far-right is starting us down a very slippery slope of "my religion is right and yours is violent and wrong so we're gonna kill all yall. "Personally, I don't want a part of Mr. Sperry's anti-Islamic extremism or his trash of a book. Outstanding, as a former GOV/DHS insider I can tell you Sperry is dead on. And, the issue is much wider than he has been able to describe.An excellent example of great investigative journalism, a must read for every American who should be aware of the pervasive undercurrents and the overt attempts by these radical factions to use our own freedoms to topple our system of govenment and kill us all. Prior to the 11Sept attacks, this is the kind of book which would only have been able to be published and distributed by some non-mainstream house,and would have been disseminated only on radical Right wing websites, in paperback (probably almost "pamphlet"-like) form, being particularly popular most likely amongst those who call themselves "re-born" Christians.In the post-attack world however, this type of man has been able to take such venomous views mainstream and is , sadly, able to get a book like this published and disseminated by mainstream houses.Similar to how other racists and religious bigots like Michael Savage, Ann Coulter, et.al., have been able to take their views mainstream by exploiting the post-9/11 knee-jerk nationalism which was caused by the severe trauma of the masses.It is a cheap tactic, frankly, but they are making some money off of it no doubt.Well, freedom of speech and press must be protected if we wish to see the US maintained in its current state.However, what of freedom of religion?? According to this man Sperry,even though he never so much as says so openly,it is quite easy to read between the lines and see that he does not advocate the same freedom of religion for Muslims as he presumably would for another religious minority such as Jews. At the end of his book in fact he outlines some plans which he says he would like to see implemented which would constitute nothing less than an egregious abridgement of Muslims' basic civil rights in this nation which still prides itself on such rights as freedom of religion. So, although Sperry will have you believe he is one of the truest of the true Americans,as American as apple pie,he is in fact at heart your basic ultra Right-wing "chicken-hawk".He is something more like a totalitarian in his views, a would-be Christian theocrat perhaps (ironically not so much unlike the Saudi Wahabbi theocrats that he constantly rails against).He is in favour of promoting an overall atmosphere of religious bigotry and bias in the US such as the world has not seen in a civilized nation since pre-WW II Germany.The Muslims in America today are in a precarious position.They are finding themselves in a similar position to the Jews in central Europe (mainly Germany) around the 1920's or so.At that time they were not yet widely persecuted ,the democratic government of that time had launched no pogroms against them, but they were already being set up for that position by certain elements of the extreme German nationalist Right which later took power in that country. If you read this book , and you try, just as an exercise,replacing the word Muslim or "Islamist" with the word Jew or Zionist you will see that what you have would be a completely unacceptable attack upon an entire people and upon their religion specifically, even going so far as to make occasional blasphemous commentaries on the religion itself and mock its beliefs in a tongue-in-cheek manner.When you try that exercise with this book you will see its eerie similarity to the kinds of things that were written about Jews and Judaism in the pre-WW II era by proto-Nazi or other like-minded German nationalist parties.This is not appropriate writing for someone who claims to stand for the best of what America represents.Sperry is setting up , through a book like this,a potential for vast programs of discrimination and institutionalized disenfranchisement and persecution of Muslims, be they immigrant Arab or non-Arab Muslims by birth, or non-Arab American-born converts to Islam.In fact in some cases in this book he treats the latter even worse. I believe someone once wrote a book similar to this one about another religion and its adherents' deviant "plans" to take over the world.Oh yes,it was the Russian Tsar's secret police, and the book was called the "Protocols" of the "Learned Elders of Zion". And this book should be viewed as just as unacceptable as that one.Hopefully it will not one day have any similar result. We can only hope and trust the majority of Americans do not take its racist and religiously bigoted drivel seriously. As far as his so-called "proofs",most of them are, as an earlier reviewer noted,simply copied from things already discovered and stated by other writers.So he offers the reader nothing truly new.Furthermore, he picks a handful of Muslims who at one time were leaders in various Muslim movements and he hammers home the point over and over again that since that time those particular men have veered from the truly spiritual path and have verbally advocated or financially-assisted in some way (allegedly at least) terrorist activity (mainly terrorist activity in Israel).It is sad that those men , who were once community leaders, came to that,but they hardly represent the mainstream Muslim population of the United States or any other Western nation. Sperry focuses on the way Islam is practiced by Wahabbists.Wahabbism is a strict interpretation of Islam,as strict as exists today really,and is only actually enforced as the official "state religion" in Saudi Arabia.Many Muslims do not, for example, take 15 minutes to wash themselves in a perfect 'wudu (cleaning) ritual before saying prayers.Many Muslims, myself included, simply wash our hands,maybe rinse off our faces,and proceed to quickly say our prayers in private. That is not asking for too much in a workplace environment, for example, is it? ?Sperry makes it sound as though all Muslims behave or practice their religion like pious Wahabbi imams or preachers in the Saudi kingdom.That just isn't the case.One could pick apart any religion like that.Are all Roman Catholics like friars living in seclusion and praying all day, loyal firstly to Rome and then to wherever they live? ?Are all Jews like Orthodox or Hasidic rabbis? ?As for following religion to the letter, not all that many people of whatever faith actually do this.Technically,Roman Catholics are not allowed to take their communion unless they have gone to reconciliation just previously and have fasted for at least one hour prior. That is the law of the sacrament.But how many Catholics do both of those things? ?How many Catholics refuse to use birth control techniques because a papal edict states they must not? ?To its eternal credit, Rome officially condemned the US's unprovoked invasion of Iraq.Thus, no true Catholic could advocate it , if he were being true to his spiritual leader.Yet how many Catholics must have voted for the administration which perpetrated that crime?Technically all Christians of whichever Christian sect are supposed to go to Mass or church on Sundays and turn the other cheek when someone strikes them!Yet how many of them can say they honestly practice this? ?Certainly the pious Right-wing non-Catholic Christian groups who endorse(d) George W Bush's unprovoked bombing, invasion, and occupation of Iraq seemed to have no qualms about granting their moral approval to the shedding of innocent blood as "collateral damage"when the bombing of Baghdad began two years ago!So much for turning the other cheek and doing unto their neighbors. 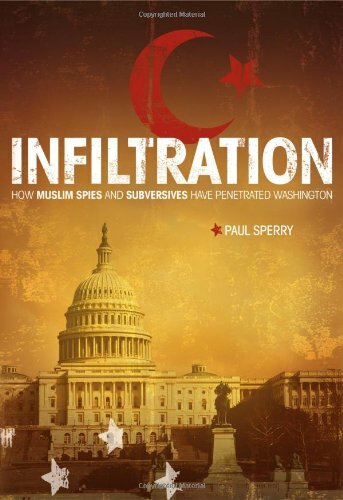 Paul Sperry's "Infiltration" drives home the point that radical Islam is on the rise around the world and especially in the United States.He starts the book providing a discussion of what he considers to be the myths about Islam including that its name means Peace.The word Islam means submission.He also demonstrates that the Quran itself permits violence against unbelievers (infidels). Sperry does a great job in deconstructing the dissembling by Muslim spokesmen when they criticize terrorism against civilians.It sounds like they are supporting the US in the War on Terror.In reality, no non-Muslim American is a civilian in their eyes and the attacks are not considered terrorism.It is just war against an enemy of Islam.Sperry notes that their speeches in English almost never match what they say in Arabic in the mosques and in their speeches to their supporters. The author also explodes the myth that the 9/11 terrorists did not receive support and help within US borders.He went to investigate where those terrorists who were based in Virginia lived.Sperry found a sizeable and very active Islamic community where some of the 9/11 perpetrators lived among those that shared similarly radical views.In this book we get a look at various mosques and imams within America that spread the message of an Islamic overthrow of the United States.When you hear them say the love America - it is an Islamic America that they love. We also get to see how a fear of being seen as anti-Islamic has compromised our intelligence gathering, our security, our politics, and our ability to speak the plain truth.It is painful to read about government employees bringing middle eastern celebratory dishes to work after 9/11 speaking openly that it is about time "they" get some payback.The author does a good job in taking us through the whole gamut of compromises, from our discussions of Islam all the way through the White House and how this radical threat continues to grow almost completely unchecked. Since this book is basically the transcripts from Bill Moyer's excellent televised interviews with Joseph Campbell, "The Power of Myth" frequently comes off as a "Reader's Digest" coffee table condensation of Campbell's life and work. Since the interview, by its very nature is limited in its scope and focus, "The Power of Myth" simply does not possess the depth of Campbell's other work. This really is no matter as what is present provides the reader with a fine introduction to Campbell's passionate devotion to World Myth. Campbell's life thesis, that man posseses the innate desire and need to create myth, is a compelling idea the binds us all to ourselves and each other. "The Power of Myth" is NOT to be taken as a religious tome. In that context, it certainly does come off as a cockeyed New Age concoction of non-commitment. It is meant, however, to be taken as a work of deconstructionist literary criticsm that seeks to celebrate the common threads running through all cultures and perspectives. Campbell openly celebrates man's ability to imagine as well as his devotion to ideas. He does not seek to debunk or trivialize the devout (one must be careful to realize this as they read Campbell). His scholarly intent as I see it, is to encourage and nurture the seed of faith inherent in all and encourage everyone to embark on their own heroic adventures of discovery. "The Power of Myth" serves as an excellent bibliography of sorts as it lists the many great folktales and religious texts which demand re-reading. Campbell urges his audience to read for themselves and search for their own discoveries. If one is searching for a far more in depth study of myth, I cannot praise enough Campbell's excellent "The Hero With A Thousand Faces". As is, "The Power of Myth" is a fine starting point. Because this book has a conversational format as it consists of a series of interviews between Campbell and journalist Bill Moyers, there are points where it becomes a bit repetitive. While Campbell makes some important points about the nature of myths and mythology in all human societies, I found that he often seems to overstate the obvious. Indeed, much of what Campbell says about myths, symbols and the human unconscious has already been covered with more intelligence and clarity by psychologist Carl Jung. Campbell generally refrains from discussing modern, political mythology - even though his general argument about the socializing nature of myths would seem to demand consideration of this aspect. Moyers probably meant for these interviews to serve as a showcase for Campbell's philosophy of life and as such he was too indulgent, rarely prodding Campbell to more fully explain some of his views. Thus, we never really get much more than Campbell repeatedly telling us to "follow our bliss." I think 'Sesame Street' communicates a more sophisticated message than that. At other places, Campbell's views are genuinely disturbing. For example, he said it is "totally improper" and even "obscene" to "judge people in terms of civil law for performances that they rendered in time of war." Moyers, once more shirking his journalistic duty, didn't press him on this matter - like asking him his opinion of the Nuremberg trials. To me Campbell's statement reads like a pseudo-philosophical justification for atrocities of all sorts. Whatever Campbell's merits as an expert on myths/mythology, he was far from being a clear-headed philosopher, and this comes out in this book. What I like about this book is that Joseph Campbell steps back and looks at the myth of good and evil where he sees that it is as if there are only two forces. To me it's as if there is a belief that one camp must destroy the other camp or be destroyed, where both sides see their side as good. While I believe that evil exists, I do not believe that there are those who are the owners of good and those who are the owners of evil. I think back to Blake's poems of Songs of Innocence and Songs of Experience where he turns to whole notion of good and evil on its head. Campbell gets five stars for this one. In his modest, unassuming way, Campbell during Moyers' series often recited from rote memory different myths and how they apply to everyday religion and life. He had the courage to say, "I don't know" when there are so many Christians who are sure they know the answers. As the years pass, we will come to respect the true power, love and uniqueness that emanated from this man. In my college years a friend who was a philosophy major introduced me to this video series (the book is a transcript), and over a period of a couple weeks, we spent many coffee fueled nights watching all six videos, interrupted here and there by heated debates and passionate arguments. Afterwards, I felt transformed. This book only scratches the surface of mythology and Joseph Campbell's other works (of which I'm determined to read), but it was a catalyst for me. "The Power of Myth" will have you exploring subject matter in anthropology, archaeology, linguistics, philosophy, world literature, history, psychology, religion, and wherever else "your bliss" takes you. I found this book and video series inspirational in the same way that a standard college course ought to be (JC was a professor at Sarah Lawrence College), except that it's much cheaper! Ten years later, I find myself returning to it and discovering new revelations each time.